For nearly a decade, the iPhone has been the gold standard of mobile photography. No other company has come close to making a phone camera as consistently great as the iPhone’s. Now, Apple has once again established its dominance with the iPhone 7’s new camera. The iPhone 7's camera can now take DSLR-quality photos thanks to all of the new components jammed into the phone. The iPhone 7 comes with optical stabilization that allows for exposures three times longer than previous iPhone models. It also has a larger f/1.8 aperture that lets in 50 percent more light. Finally, the phone has four LEDs that produce 50 percent more light when the flash is in use. Those are significant improvements on almost every component. The brains behind the camera—the image signal processor—has also been upgraded and makes it really hard for people to take bad photos. The sensor reads the scene and uses machine learning to look for people and objects in the photo. Then, the processor sets focus, exposure, white balance, tone mapping, noise reduction, and even takes multiple photos and fuses them into one photo. It basically goes above and beyond to make sure you always come away with a great photo, regardless of the shooting conditions. 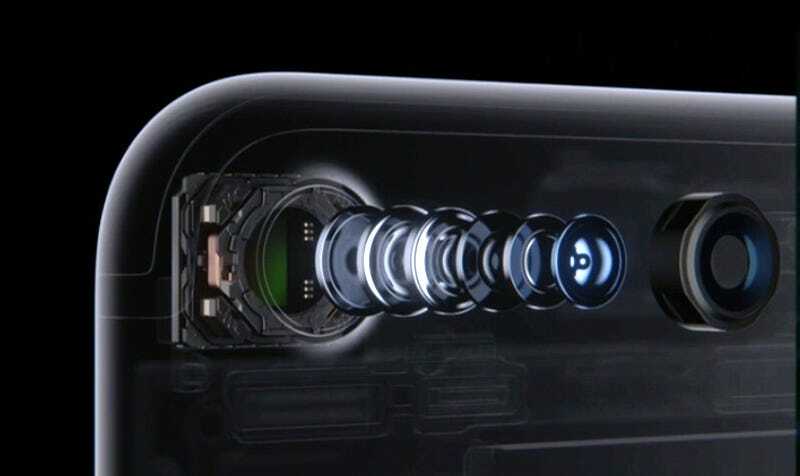 But all of that pales in comparison to Apple’s biggest camera announcement: The iPhone 7 Plus comes with two lenses, one wide-angle and one telephoto, that are both visible on the back of the phone. The combination of both lenses gives shooters a better chance to play with focal length and zooming in photos. The depth of field capabilities are something that is typically only seen in DSLRs. Apple admits it’s not trying to replace anyone’s DSLR camera, but for most amateur shooters, the new iPhone will be the most powerful camera they’ve ever owned.